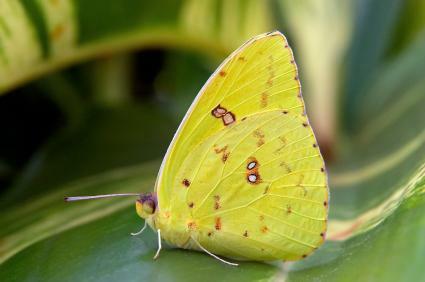 With a wingspan of 2⅛ - 2¾ inches (5.3 - 7 cm) the cloudless giant sulfur butterfly (Phoebis sennae) is one of the largest of the group of butterflies known as the sulfurs . All of the sulfur butterflies belong to the family Pieridae and all are yellow to orange in color. Cloudless giant sulfurs are found in South America and in most of the mid to eastern United States up to Canada. They are most commonly found in regions that stay warm year round. Because adult giant sulfurs feed on flower nectar they are usually found in open fields and anywhere where flowers are present. Some of their favorite flowers are butterfly bush, marigolds, sunflowers, dahlias, and zinnias, but they will feed at many other kinds of flowers. Host plants for their larval stage are primarily Sennas (Cassia spp. ), but legumes, partridge pea, and clovers (Trifolium spp.) can also serve as host plants. Female cloudless giant sulfurs typically have two dark spots on their forewings (seen when their wings are extended), but males usually don't have these spots. The female butterflies lay white eggs on a host plant. As the eggs mature they turn pale orange. Eggs usually hatch in about one week. The larval stage or caterpillar of the cloudless giant sulfur is yellow with about 11-12 dark vertical stripes on its body. The caterpillar also has some small black dots on its back. It usually constructs a "tent" by using a strand of silk to fold up a leaf so that it has some protection from predators and the elements. The pupa or chrysalis can be either yellow or green with pink or green stripes on it. The chrysalis is pointed at the top and bottom. Cloudless giant sulfurs produce two broods per season in northern areas, but reproduce year round in southern areas where the temperature remains warm year round. The cloudless giant sulfur is not on the endangered species list. Copyright © 2008-2018 ButterfliesSite.com. All rights reserved. Images from istockphoto.com and may not be copied.